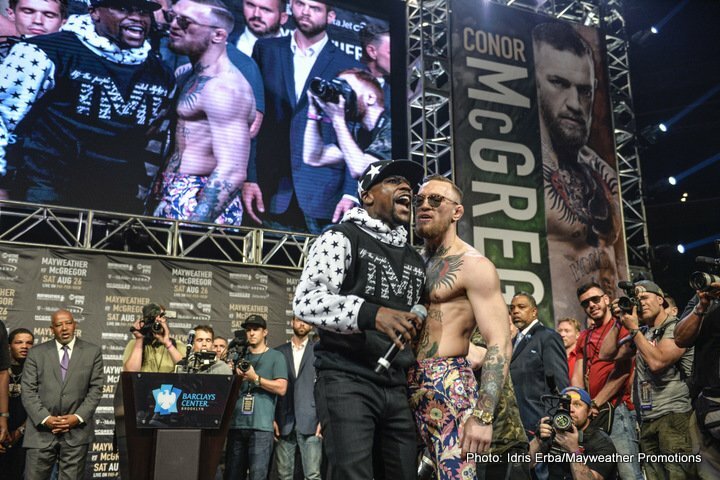 By Jim Dower: Floyd Mayweather Jr. vs. Conor McGregor will reach more than 1 billion homes worldwide, according to UFC president Dana White. The fight is projected to bring in a whopping 4.9 million pay-per-view buys in the U.S., which would shatter the existing record of 4.6 million buys for the Mayweather vs. Manny Pacquiao fight from 2015. We’ll have to see if White is correct about the Mayweather-McGregor fight bringing in the huge PPV numbers that he’s speaking about. As far as the fight reaching 1 billion homes worldwide, we’ll need to take White’s word at that. I don’t know if it will or won’t. The money for the fight is coming from the U.S. That’s where McGregor and Mayweather will be making their huge fortunes. Mayweather says he’ll make $350 million. That’s a lot of money for a fight that is considered to be a non-competitive fight. “Everything is tracking right now like we’re going to kill this thing,” White said. This could be a disaster for White if McGregor pulls in far more than the $100 million that he was originally expected to make for the Mayweather fight. If McGregor is so filthy rich after fighting Mayweather on August 26, he might not want to come back to the UFC and make small money in comparison. There’s also the possibility of a Mayweather-McGregor rematch in the octagon. Surely, McGregor will want to risk losing out on the Mayweather rematch by going back to the UFC and taking a risky fight that he could lose. McGregor is better off waiting to find out whether Mayweather will fight him in a rematch rather than returning to the UFC right away and fighting before the end of the year as he had originally planned to do. It would be amazing if McGregor makes $150 million for the fight. It’s incredible money for a UFC fighter to get that kind of a paycheck for just 1 fight. Mayweather-McGregor will likely break the gate record of $72 million set by Mayweather vs. Manny Pacquiao. Over $60 million worth of tickets have been sold already. The tickets remaining are the high-priced ones that the boxing fans and celebrities with deep pockets can afford. There are 3,000 more tickets available at the T-Mobile Arena in Las Vegas compared to the MGM Grand in Vegas, which is where the Mayweather-Pacquiao fight took place 2 years ago. There’s more money to be made with the extra 3,000 tickets, as long as the fight sells out. It’s still not sold out though with 8 days to go. Trainer Freddie Roach wonders whether Malignaggi intentionally struggled against McGregor during his brief 2-day sparring stint with him. Roach was impressed with what he saw from McGregor of the clips of the sparring that were released by Dana White. Roach says McGregor has some power in his left hand, and he feels he’s got some skills to potentially give Mayweather problems. Roach still wonders whether Malignaggi took it easy on McGregor during the sparring. Roach is hoping that’s not the case. “Paulie’s a good kid, but did he really need money as a sparring partner,” said trainer Freddie Roach to Fighthype.com in wondering why Malignaggi chose to volunteer to work as a sparring partner for McGregor. “I can’t [understand]. It’s very odd. I don’t know. One guy active [McGregor], [and] one guy not [Malignaggi],” said Roach in discussing the circumstances surrounding the sparring between McGregor and Malignaggi. Malignaggi has made a great deal of money during his boxing career, and in his job as a commentator. It’s very strange to understand why a guy with the money that Malignaggi apparently has would want to work as a sparring partner for McGregor. Did Malignaggi do it for the money or more for the publicity that he would receive by having his name mentioned frequently as McGregor’s best-known sparring partner? Malignaggi definitely received and is still getting a lot of attention from the boxing and MMA media. This is probably the most attention that Malignaggi has ever received in his life. His boxing career was not one in which he was talked about a great deal by the casual fans of the sport. Malignaggi nevr fought Mayweather or Manny Pacquiao. His biggest fight of his career was against Ricky Hatton years ago. Malignaggi was the B-side for that fight. ”Paulie looked like he got beat up a little bit,” said Roach. ”The tapes do show, but we don’t know if the tape shows the other way. He looked pretty good. He had a strong left hand. He does have power. 3 or 4 times [McGregor landed good shots]. I was very surprised. It was good technique, but Paulie hasn’t fought in a long, long time. He’s an announcer. He did make a comeback fight. I don’t think he’s at Mayweather’s level, but maybe he’ll be able to do something,” said Roach. Malignaggi’s face looked pretty beaten up from the leaked photos, but he didn’t look nearly as bad in other photos taken days after the session. Malignaggi’s face looked worse than it was. Malignaggi looked out of shape during the sparring. He wasn’t the slender fighter that he fought last March in losing to Sam Eggington by an 8th round knockout. Malignaggi had clearly gained weight. That would be disappointing if Malignaggi fought under his level on purpose so that he would make McGregor look good to help him bring in more PPV buys for the fight. Roach clearly doesn’t understand how Malignaggi would struggle against a non-boxer like McGregor. The sparring showed that McGregor has some pop in his punches. He lacks the hand speed of previous Mayweather opponent Saul Canelo Alvarez, but he’s got decent speed.